Haven't we all, even for the briefest of moments, wanted to escape our reality and venture forth into such a beautiful and magical world such as Vincent Van Gogh's The Starry Night painting? It's one thing to experience the painting, but becoming the artist himself and understanding how difficult it must have been to be stuck in an asylum and still create something so beautiful based on his memory and what he could see from his window, would be very interesting. 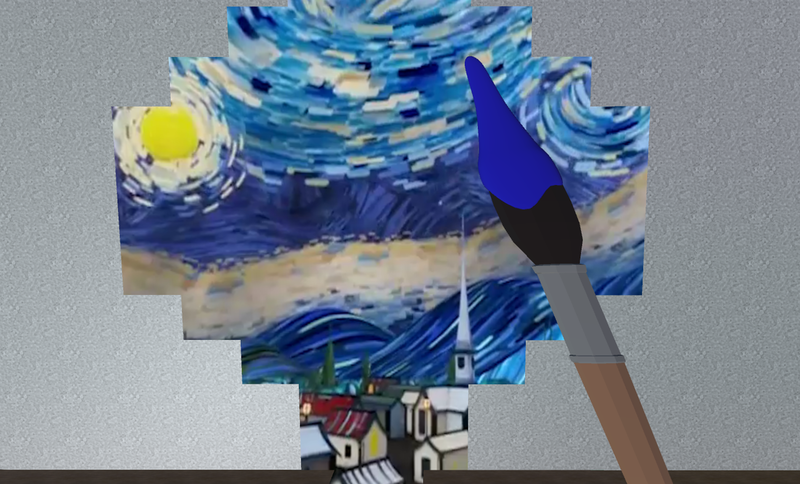 Creating an interface that reimagines how people interact with immersive 360-degree video using Google Cardboard, I hope to give the user the experience of being Van Gogh trapped in his room while he created The Starry Night from within his mind. In order to paint this painting, Van Gogh would have had to paint mainly from memory and from the little bit of the outdoors that he could see through the bars on his window. Although none of his paintings contained the bars on his window that impacted his view, I decided to put them on the window in this room to make the user feel closed in and isolated from the world, as I'm sure Van Gogh felt. 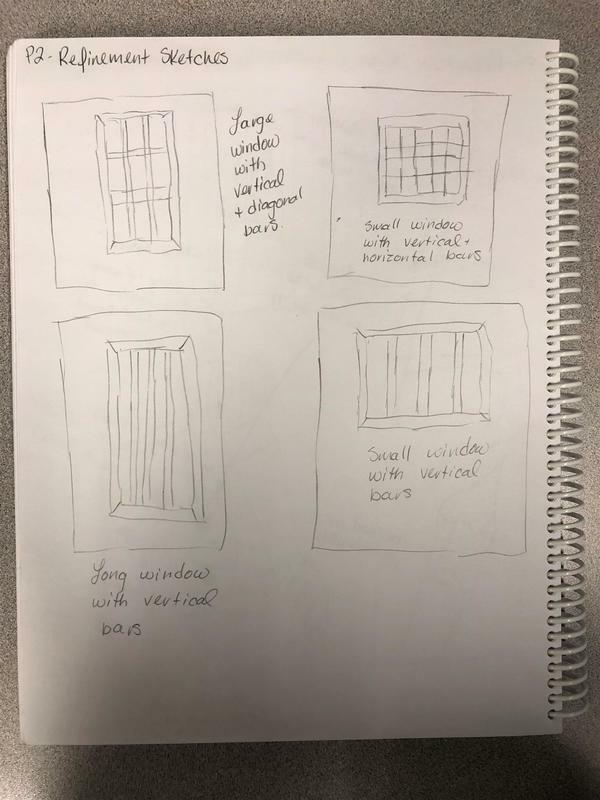 I allowed the video to be seen through the bars though, to entice the user to look through the window to paint away the bars. 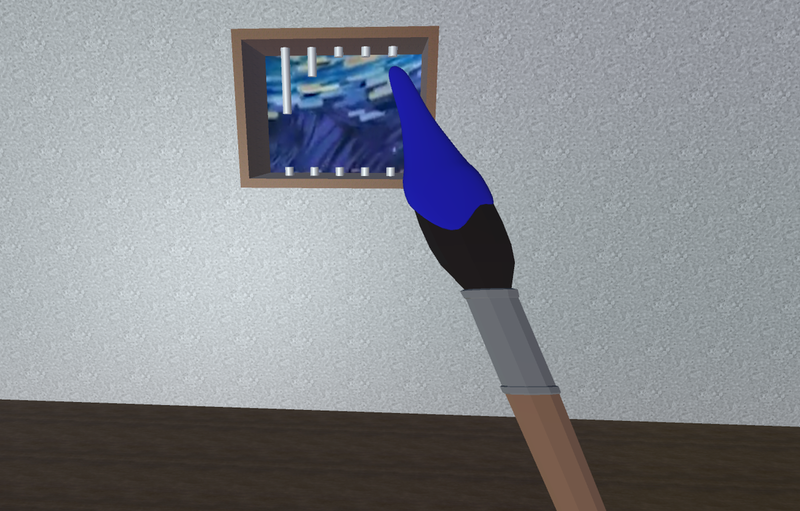 I decided to give the user a paintbrush in order for them to paint away the walls, so that they are able to free themselves from the room. 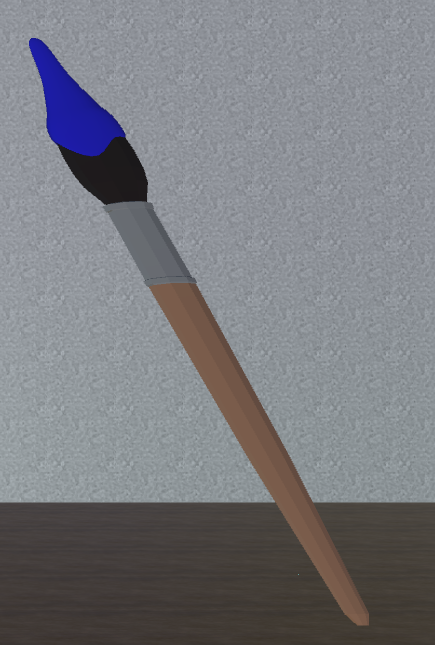 The paintbrush is moved by the user's head, as they look around the room with the Google Cardboard glasses. 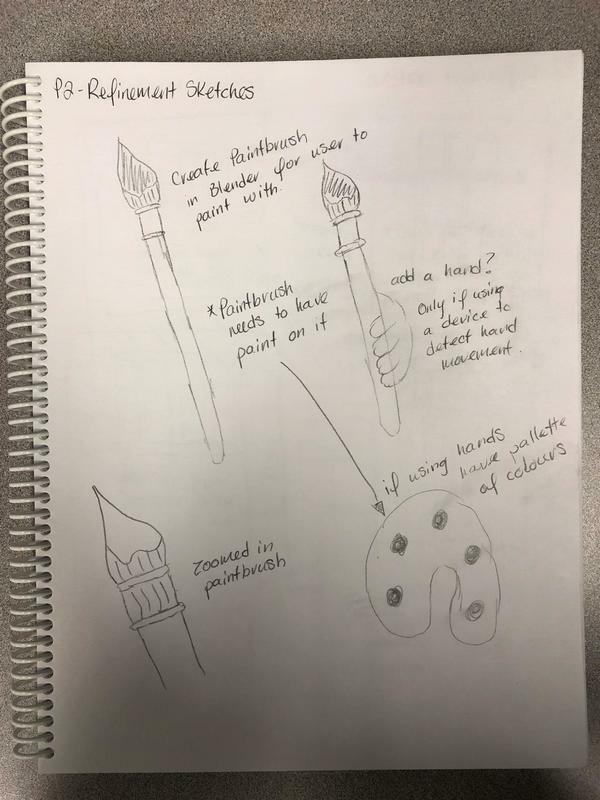 The paintbrush is the tool of interaction to symbolize how the world in the 360 degree video was created. Also, it symbolizes how Van Gogh was able to take a drab reality, and paint it into a colourful masterpiece. The user must first paint the bars away before they can start painting the rest of the room away. This is to symbolize that the bars themselves are the key to enable the user to start to escape their current reality and experience the magical reality that is Van Gogh's The Starry Night. My concept sketches were based mainly on interactions the user could have with the 360 degree video. Interactions such as using head movements, or external properties that could affect how the user would experience the video. I wanted to develop a lot of unique ideas on interactions that could be applied to a broad spectrum of 360 degree videos. Many of the sketches I came up with did not have a clear story that I could work with right away. But with some minor adjustments, the sketches could be used to fit many different stories. I started this project creating detailed variations for a completely different idea. 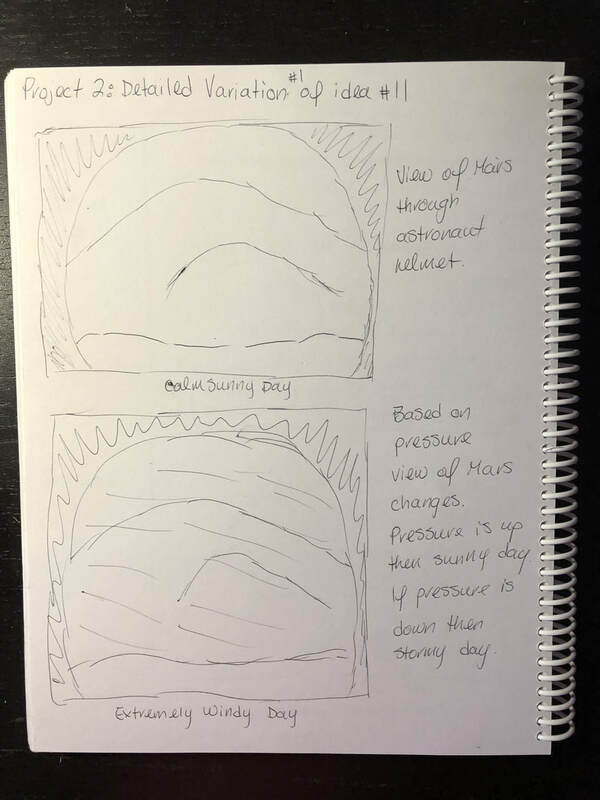 The idea was that I used barometric pressure in order to have the user experience what the weather would be like on other planets. 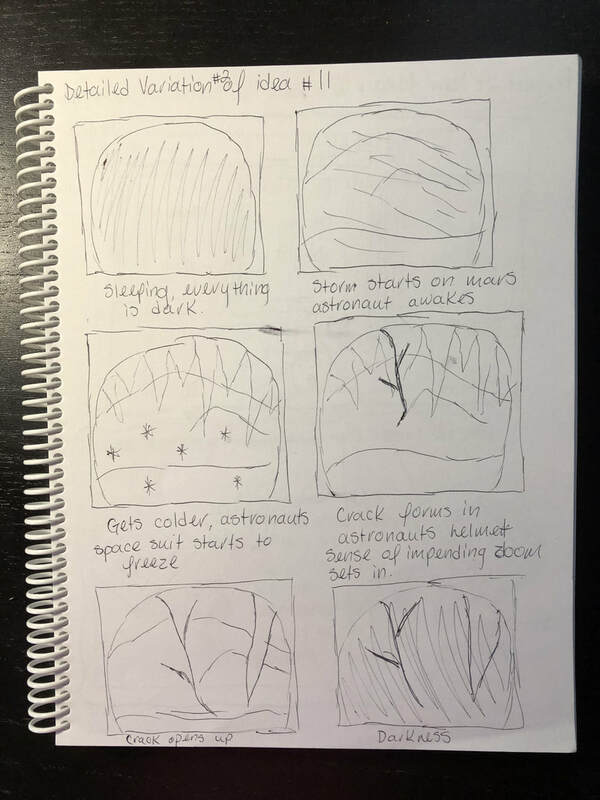 As the story for these sketches evolved, I looked for 360 degree videos relating to my idea, but I could not find a 360 video suitable for it. I found one video of a space walk on the International Space Station, but I was unsure of how to reimagine my idea with it. Therefore, I abandoned that idea and changed directions. From the above concept sketch, I was able to create many detailed sketches revolving around Vincent Van Gogh's painting called The Starry Night. I based my sketches on the story of Van Gogh and his time in an asylum in Saint Remy, where he created the painting. I also used some of the interaction features I came up with in my concept sketches, in order to reimagine how the user could interact with the 360 degree video. For my refinement sketches, I looked at different ways to represent the paintbrush, the windows and the room. 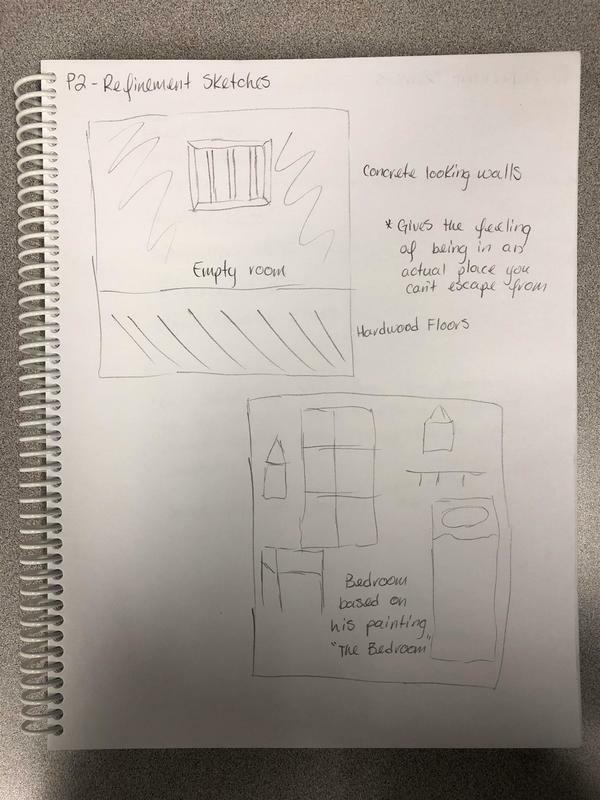 Based on these sketches, I implemented the ideas that created the look and feel that I wanted the user to experience. To run the .exe file, click Runnable Executable and download the Project2EXE.zip file. To access the source code, click on Source Code and download the CPSC581Project2.zip file.